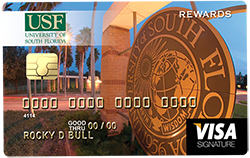 Show your Bull pride with the Official USF Rewards Visa®. Every purchase made provides valuable financial support to the USF Alumni Association and its student programs, at no cost to you. 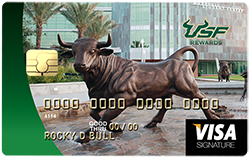 The USF Rewards Visa combines high-value rewards with a low rate and no annual fee; so there's no need to juggle between cards. Earn one point for every dollar spent and redeem for travel, cash and more. Earn Extra Credit with Your Intro Offer: Triple points for 90 days, or 10,000 bonus points1. With Rewards for U (aka CURewards), your points add up quickly and are conveniently redeemed through Online Banking. To track or redeem your points, click the "Visa Online" tab within online banking, then click on the Rewards for U icon to see an overview of your point balance. 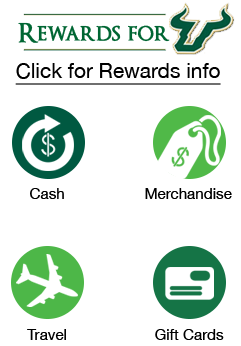 Click on the Rewards icon on your summary page to be directed to the Rewards for U redemption site. Earn extra points by shopping the Online Rewards Mall (within the Rewards for U site). Bonus points vary (earn up to 10+ points per dollar!) and feature top retailers such as Bloomingdales, Game Stop, Bass Pro Shops and many more. Redeem points for flights, car rental, hotels, cruises and vacation packages. Only 25,000 points needed for a roundtrip ticket anywhere in the US 48, with 21-day advance booking and a Saturday night stay. Need more flexibility for your travel? No problem! For 25,000 points you can receive a $325 airline ticket credit. Travel rewards are provided by Montrose Travel. You can peruse and book travel rewards online, or speak with a travel agent by calling 1-877-219-4988. Do you live by the "cash is king" philosophy? Redeem points for cash up to 4 times per year, with only 5,882 points required to earn $50. Redemptions will be deposited into your USF FCU savings account within 10 business days. Redeem your points for gift cards; featuring top merchants such as Walmart, Target, Amazon, iTunes, Shell, Darden Restaurants and The Home Depot. Purchase a $50 gift card for 7,700 points, or a $100 card for 13,600 points. Redeem points for premium merchandise. Whatever your heart desires, you're bound to find it in the Rewards offerings; from electronics, movies, music and books to outdoor sports, fitness equipment, home furnishings and kitchenware. 1. $3,000 of qualified spend in the first 90 days required to earn 10,000 bonus points. Returns, cash advances and balance transfer transactions do not earn points. 2. APR= Annual Percentage Rate. Variable rate card based on Prime Rate; rate may change after account opening. Subject to loan approval. Rates vary by credit score.